This building was described as follows in an environmental impact study prepared for the Metrolpolitan Transit Authority in relation to its project for completing the Second Avenue subway (May 2004), "The two-story terra cotta clad building (NYCL-eligible) at 2291 Second Avenue between 118th and 117th Streets possesses a unique and ornate design for a commercial building. It was designed by Michael Shutkind and built in 1929. It features a gabled parapet with scrolled designs and a roundel in the center of the parapet that reads 'Fischer & Co. Pure Pork Products'" (www.mta.info). The Building Permits Database at the Office for Metropolitan History provides the following information, "NB 85-29; cost $25,000; 2-story brick offices and stores; owner: Household Realty Corp. John Houser, pres, 2325 2d Ave.; architect: Richard Shutkind, 147 4th Ave."
Important elements in the building permit are the owner's name and address. 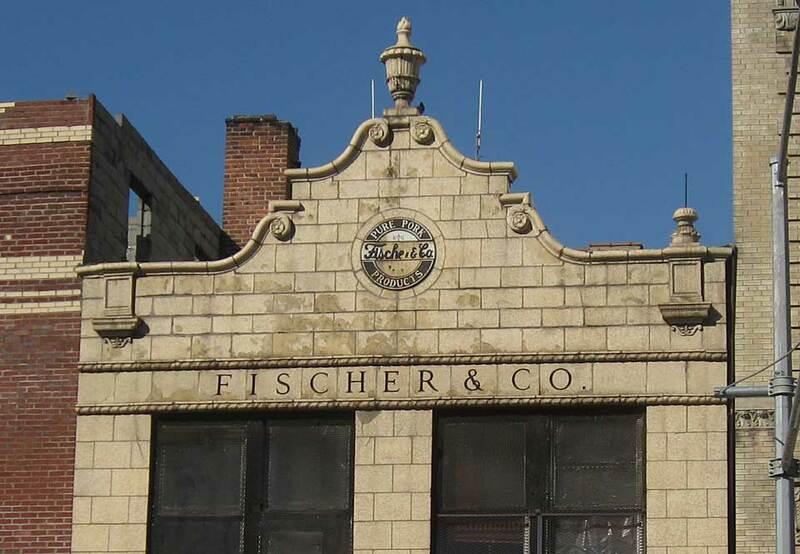 The address 2325 2nd Ave. was the original location of Fischer & Co. in 1900. The founder, Jacob Fischer (1872-1910s? ), was recorded in the 1900 U. S. Census living at this address with his partner, Bernard Levy (1877-?). In the prior year (1899) Bernard Levy's naturalization petition stated that he was born in Germany 17 May 1877 and that he lived at 2325 2nd Ave., New York City. Later in 1899 Bernard Levy applied for a passport where he specified that he was born in Gernsheim, Germany, and that he emigrated from Bremen 16 May 1893. This application was signed by a witness, John Graf, who lived at 2325 2nd Ave. Jacob Fischer himself, age 31, applied for a passport in 1904 when he lived at 2325 2nd Ave. In his application he stated that he was born in Middfischliectbach, Germany, 5 July 1872, and that he emigrated from Bremen 1 Aug. 1890. Fischer & Co. Provisions were located at 2325 2nd Ave. from the date of their founding, 1900, until 1929, when they moved to their new building shown above, 2291 2nd Ave. The business remained here until approximately 1960. Jacob Fischer seems to have died in the 1910s. He was last listed in New York city directories in 1918. In the 1920 U. S. Census his widow, Kate Fisher, lived at 2325 2nd Ave. with her son Jacob Fischer, Jr., age 13. Bernard Levy was listed at 2325 2nd Ave. through 1911. Then in 1913 he appeared as the proprietor of his own provisions business, the Bronx Provision Co., located at 3022 3rd Ave. In the 1925 New York city directory the Bronx Provision Co., Bernard Levy, pres., had four locations in the Bronx. In the 1930 U. S. Census he lived at 2563 Davidson Ave., the Bronx, and gave his occupation as "Buyer, Provisions." In addition to Jacob Fischer and Bernard Levy, among others connected with Fischer & Co. was John Herman Hauser (1885-1967). Hauser is probably the "John Houser" recorded in the 1929 new building permit as president of the building owner, Household Realty Corp. He was listed as one of two proprietors of Fischer & Co. in Polk's 1933-34 New York City Directory. Another proprietor at Fischer & Co. was Valentine Brech (1888-1982). In the mid-1920s he was listed as a proprietor of Fischer & Co. along with his brother, John Brech, and Benedict Klingler. Like Fischer and Levy, Valentine Brech was an immigrant from Germany. His passport application dated 1919 indicates that he emigrated from Hamburg November 1907 and that he became a natualized citizen 4 July 1913. He registered for the World War I draft in 1917, when 29 years old, born 29 April 1888 in Nackenheim, Germany. He gave the same information when he registered for the World War II draft in 1942. By this time he was the owner of the Yorkville Packing House located at 1530 2nd Ave., Manhattan. Not shown in the image above is an inscription reading Pure Pork Products above the first floor at 2291 2d Ave.